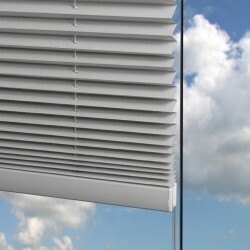 Lumon’s pleated blinds for a balcony, terrace or ceiling provide sun protection and privacy. Each blind is custom made for a single glass panel, allowing them to move together smoothly. Our sunroom shades can add style, as well make your room more functional providing you with all the necessary control whether you want to reduce lighting, protection from UV rays or some privacy. Our blinds can be opened from the top or bottom and lock in any position. 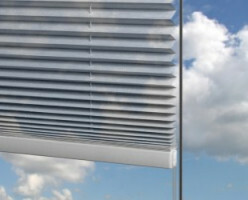 When fully retracted, the blinds are hardly visible, leaving unobstructed views. Blinds for your balcony provide privacy and protect your balcony from direct sunlight, making your outdoor space more comfortable. They’re easy to adjust to allow in as much, or as little, light as you like. In addition, the outer fabric of each blind has a thin metal film that helps to reflect sunlight, keeping your balcony cooler. 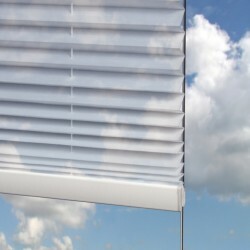 Blinds for your sunroom can protect you from direct sunlight and curious neighbours. As with our balcony blinds, our sunroom blinds are easy to adjust so that you’re always comfortable. Lumon blinds make a great addition to balcony railing systems. They provide privacy while also letting in natural light. Each blind can be adjusted from the top or bottom for maximum flexibility. All our balcony glass and sunroom shades are available in a variety of colours and transparency levels. Lumon blinds are antistatic and made of 100-percent polyester. See below for a description of their reflection, light absorption and permeability properties.